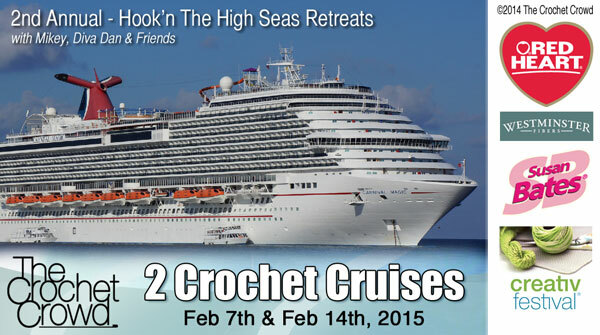 2 Fabulous 7 Day Crochet Cruises in February 2015. Announced only 3 days ago is the two crochet cruises planned for February 2015. We announced it briefly on The Crochet Crowd Facebook to give an advanced warning. We know many crocheters have been waiting for this announcement. In only 2 days, we are getting close to being 50% sold out for both cruises already! It’s surprising me like you wouldn’t believe. The Exotic Crochet Cruise is leaving Feb 7th, 2015 for 7 days touring the Eastern Caribbean. The Love To Crochet Cruise is leaving Feb 14th, 2015 for 7 days touring the Western Caribbean. While on board with us, we are conducting some workshops, informal ‘fish & stitches’ and more. Our sponsors are hooking you with with learning materials and goodies. We have a sponsorship capacity of 60 guests per cruise. At the time of writing this, we currently have a tie for both ships of having only 38 seats left for each. How it works… You contact our Agent at Carnival Cruise Lines to get a quote. The prices depend on you as you can select your cabin prices an much more. Once you have booked, you then register for our activity fee that is $50 USD per guest who are attending our workshops. You might have family or friends that will accompany you but not interested in our activities, they don’t have to pay this fee is they are not doing workshops. You can book their your own agent but you still must call Donna as she is linking all reservations together so you are sitting with us for dinner. Our registration fee of $50 is a limited early bird special and will run until Feb 28th, 2014. On March 1st, this rate goes back up to regular price at $75 per guest. Both cruises are going back to back. Cruise 1 guests can opt to stay on board and sail with us again for a 2nd week. You registration price is now $90 which covers you for both cruises. This offer is only available until Feb 28, 2014. On March 1, 2014, this goes back up to regular price at $150 per guest. The back to back option is only available as long as there is space on both ships. As soon as one ship is sold out, the back to back is no longer an option. We have 9,000 people on our mailing list that haven’t been notified yet. The first general notice will be mailed out tomorrow (Sunday) to notify all of these people that our cruise is currently booking. Based on the current rate of tickets sales, we could potentially be sold out as early as the end of next week. Truth is, we didn’t expect these cruises to sell so quickly. We are excited that crocheters are excited by the opportunity to do fun stuff on board with us. For details and everything you need to know. Visit our Crochet Cruises Page. Each cruise has it’s own article to visit. This entry was posted in Crochet Cruise and tagged 2015, Caribbean, Carnival, Carnival Cruise Lines, Crochet Cruise, Exotic, Love to Crochet, Miami, Mikey, Workshops. Bookmark the permalink. I so won’t to go!